There's plenty of fun to be had for families at Aquarium of the Bay this spring! Aquarium of the Bay focuses on the aquatic animals that live right here in San Francisco Bay, featuring sharks, rays, sturgeons, moray eels, and more. You can even take a walk under the Bay itself in the Under the Bay exhibit and touch animals like leopard sharks, sea stars, and bat rays in Touch the Bay! The aquarium offers special programs for all ages this spring including Riveropolis and Predators of the Bay. We're giving away a family pack of four tickets to the aquarium; read on to find out how to enter to win. At Riveropolis, play, engage, explore, and discover in this miniature river that doubles as in interactive art exhibit through April 19, 2015 from 10 am to 5 pm. Simulating a river that flows from the mountains to the ocean, this multi-level river is perfect for kids of all ages and sizes. Not just for looking at, this dynamic river has it all, including arts and crafts and engaging hands-on opportunities. Make your own raft or boat at the crafts table using reclaimed materials, such as wine corks and popsicle sticks. Then, place your handiwork on the stream and watch it float down the river. Created with everyday materials, this portable river engages and informs kids and adults alike. See how our rivers are connected to the ocean and learn about the importance of our waterways as you watch water flow down the stream. 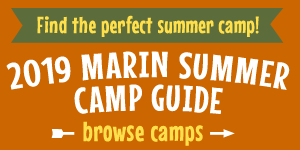 You can also explore San Francisco Bay's predators during Spring Break. Find out which predators rule the food chain as Aquarium of the Bay celebrates Predators of the Bay. Throughout Spring Break, April 7 to 12, Aquarium of the Bay will feature top predators from the various ecosystems around the Bay. From the unassuming sea star to the clever river otter to the awe-inspiring shark, find out what makes these animals the top predators of their ecosystems. We're giving away a family pack of four tickets to Aquarium of the Bay for Spring Break! To enter for a chance to win, send an email with the subject line "Aquarium" to contests@marinmommies.com. Entries must be received by 11:59 pm PDT on Tuesday, April 7, 2015. Read our complete contest and giveaway rules here. Aquarium of the Bay is located at Pier 39 on San Francisco's waterfront, at Embarcadero and Beach Streets. Admission is $19.95 for adults, $11.95 for children 4–12 and seniors 65 and over, and $64 for a family of four. The aquarium is open daily; hours vary. For more information and a schedule, visit www.aquariumofthebay.org.